So tiny that it's pointless and impossible to read or tiny and easy to mount yet sufficiently clear and ledgeable to be worthwhile as an accurate speedometer? No use to me - maybe if you are young and have good vision, I don't think there is enough contrast either. If you buy one via the net from an EU company you can always return it under the distance selling act, just check their terms first. Ok so being possessed of acute eyesight I have taken the plunge. Will report back once delivered and installed. Ok so first impressions. Nicely packaged and well presented. Instructions while in a little bit of chinglish are readily understood. Simple to plug in. Took a little while to connect but that could be because of the mud and dust that covers the inside of Ermintrude. Once connected the display is actually really easy to read the speed especially is about 20mm high and a nice sharp white. The other info while smaller are still crisp and ledgeable. The units are easily converted between k and m ph. The speed is off the bat about spot on the GPS without any adjustment but I've only driven a couple of miles so need to confirm. I'll have a further play today but so far I'm impressed. So after more playing with the menu it seems to be able to do some useful stuff like clear codes if you have any and also give live and freezable data. It can also do some frivolous things like 0 to 60 runs and 60 to 0. All in all me likey. Might I inquire where you bought it? Amazon. 26 99. Autool x50 plus. There's 2 listings for what seems to be the same item. I got the cheap one. Seems legit. I reckon that is a really good find. Was looking for a fault code reader and about to drop a few quid on one. That wee device you found looks much more interesting and useful. Last edit: 11 Feb 2019 18:17 by adrianr. 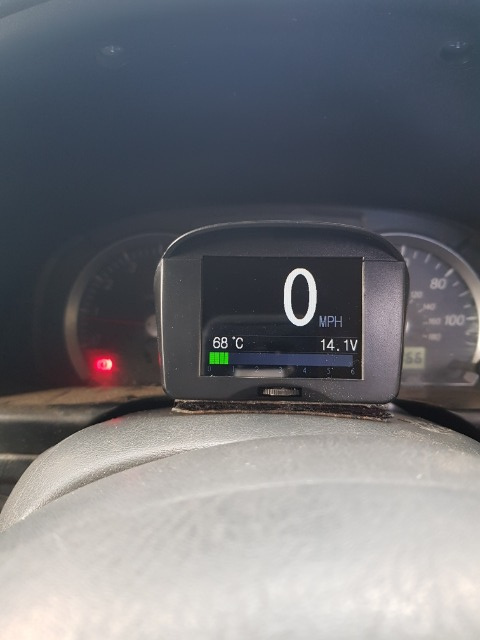 I haven't had recourse to the fault finding side of it yet but as a speedometer and rev counter and fuel use indicator it's more than just a toy. I've just ordered one. Thanks for the recommendation.